Whether you have a relatively new boiler, or something a little more antique, it’s a good idea to keep your boiler well-maintained by giving it an annual service. 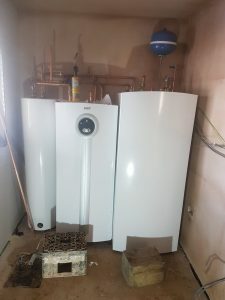 At Absolute Plumbing and Gas Solutions Ltd, we keep boilers working to provide warmth and hot water to homes and businesses in the Dunstable, Luton and Milton Keynes areas. What Does Our Service Consist Of? We offer an annual boiler service for as little as £59 that includes a full inspection of your boiler to keep it ticking over. By having your boiler checked every year, it can potentially save you a significant amount of money if something more serious goes wrong. Boilers are made up of a huge number of parts susceptible to corrosion and damage. With a service, our expert engineers can diagnose any problems early, reducing the risk of catastrophic breakdown and giving you peace of mind. We will also send you a reminder to let you know when your next annual boiler service is due. Absolute Plumbing is a family owned and run business that has over 25 years of experience providing services for boilers. Our team of fully qualified engineers is all Gas Safe Registered our work is approved and protected by the OFTEC warranty scheme. Our technicians are capable of servicing all types of boilers including the most popular brands. If you seek the assurance of knowing that your boiler is in safe hands then give us a call. We will always give you honest advice and service you will value, like many of our happy customers in homes and businesses in the Luton, Dunstable and Milton Keynes area.